Jumping Ninja by Vimukti Technologies - How far can you climb? Thus far, BlackBerry hasn't been known for having a lot of great games to choose from. Sure, there are tons out there, but most people shy away from them for various reasons. I have a few on my Torch that I enjoy, and I just added another! Jumping Ninja by Vimukti Technologies looked awesome and got me instantly hooked. It's a simple concept: you're a ninja, running up a wall. There are obstacles and enemies to avoid and eliminate. You have to avoid getting knocked off the walls while climbing higher and higher, jumping back and forth between the walls. It kind of reminds me of Doodle Jump or Chopper, in the "how far can you make it" genre. The graphics on this one are great, and game play was smooth for me. The only issue I had was with the sound; I couldn't get it to turn off. 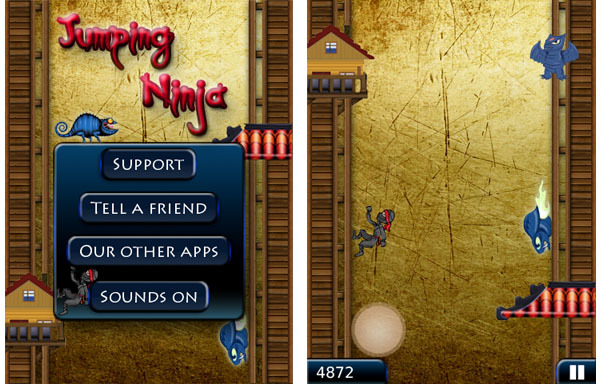 As the controls are for Touch screen devices, Jumping Ninja is only for BlackBerry Storm and Torch, OS 4.7-6.0. The game costs $2.99, but has a 2 day free trial available, which is awesome. Check it out!